I’m not the biggest fan of sushi. I do prefer my fish cooked. But 20 years ago, I was introduced to Inari. Inari is only (only!) rice mixed with rice vinegar and wrapped in a envelope of fried bean curd. Let me just say, if you’ve never had sushi, you should start here. Inari is the gateway sushi. In the late nineties, I became friends with a Japanese exchange student that was working in the same hospital pharmacy. 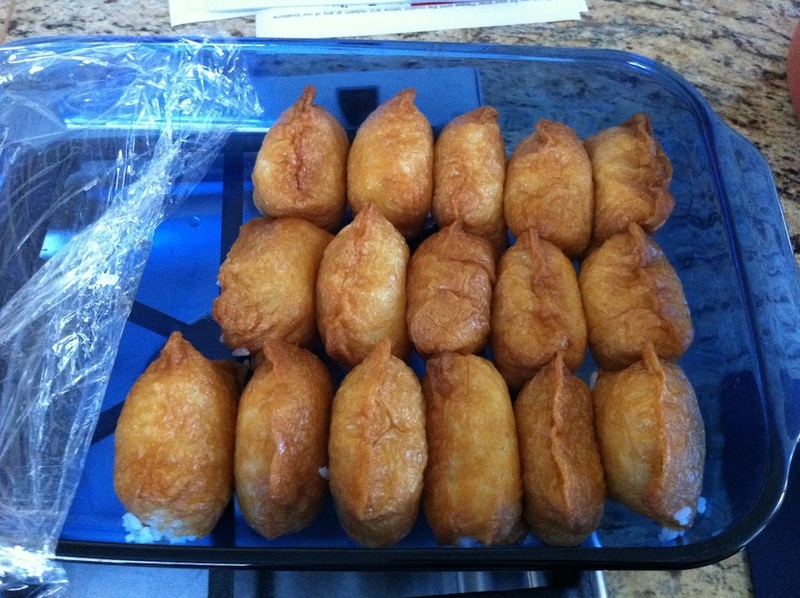 One day (at my request), she made the whole crew a big platter of home-made Inari. I was in heaven. She kindly wrote the recipe down, but I don’t read Japanese and never had an opportunity to make this delicious dish. The can included a recipe, which I slightly modified. 2 cups rice – I use calrose and I cook it in a rice cooker. Drain the liquid from the can and try to get the friend bean curds out of the can without cutting yourself or damaging the delicate wrappers. In a non-metallic bowl, mix the rice, vinegar and Mirin. It’s okay if it seems a little wet, it keeps the wraps moist the next day. Let this cool in the refrigerator for a while, maybe an hour. The Inari wrappers remind me of English muffins. They’re not exactly pre-cut, but they do split easily with some care and attention. Open one Inari wrapper and hold it in your palm. Stuff 2-3 tablespoons of rice into the pouch and compress. Try not to squeeze the liquid out, just compress. When the wrappers are about full (3/4) fold the edges over and place up-side-down. I eat some of them immediately (duh). 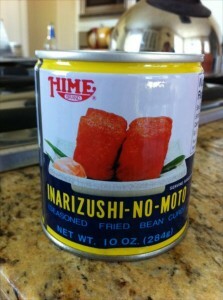 I like them with some hot wasabi and a little soy sauce. 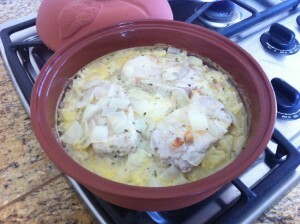 I prepared this dish in my apple ceramic baker. 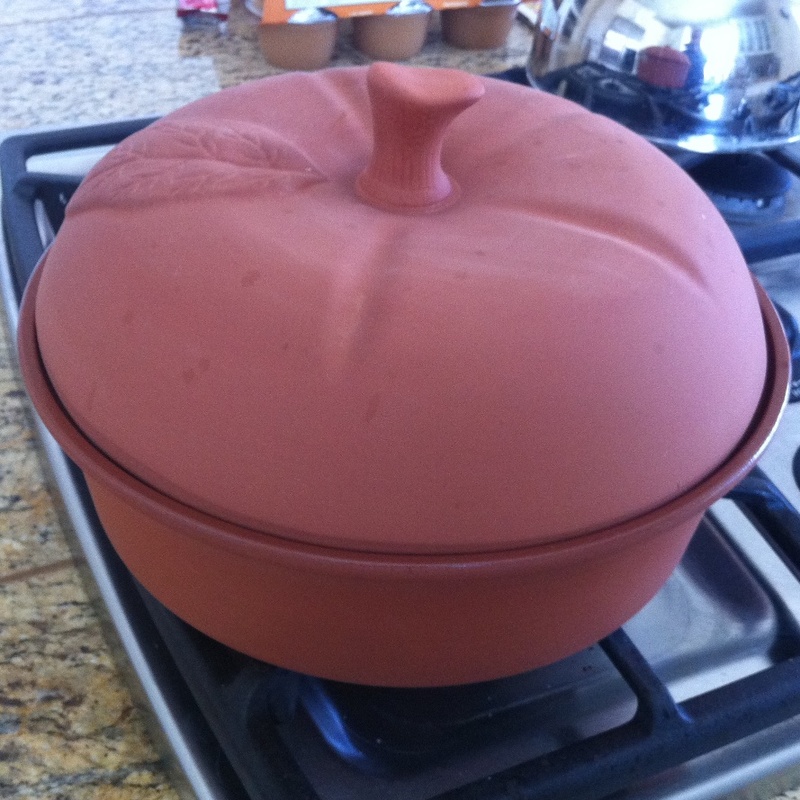 The lid has to be soaked for 30 minutes before baking. It keeps everything moist. The instructions included with the ceramic barker included a recipe for pork chops. The original recipe called for cream of mushroom soup, which I exchanged for cream of chicken. Make an even layer of rice in the bottom of the baker. Place pork chops on top. In mixing bowl, combine soup mix and milk. Add onions, salt, pepper, garlic powder, and tarragon. 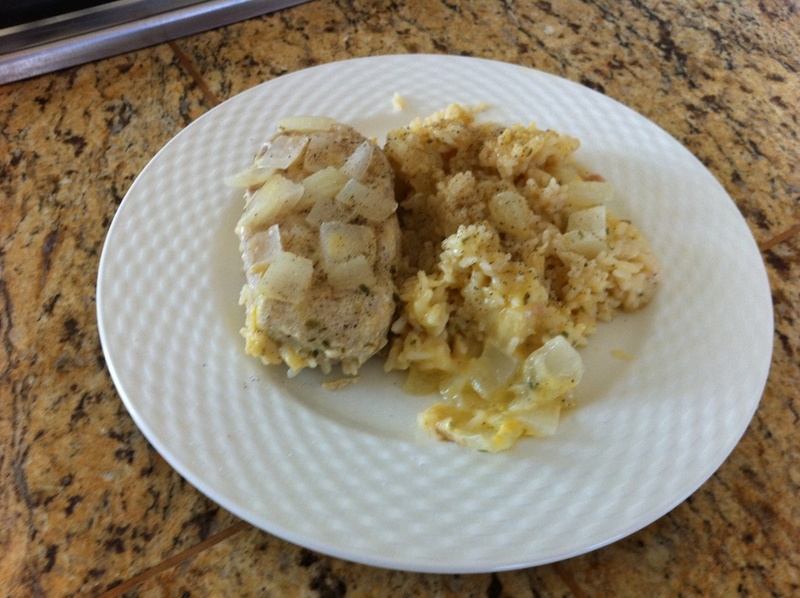 Pour mix over pork chops and rice. Cover with pre-soaked lid for one hour at 350 degrees.